These Chromatography Media are made from polystyrene (UniPS®), polymethyl methacrylate (UniPMM), copolymers of polystyrene and polymethyl methacrylate (UniPSN).Nanomicrotech`s monodisperse Polymeric Chromatography Media have been successfullyapplied to the isolation and Purification Of Plant Extracts (taxol, docetaxel, huperzine, ascutellarin, stevioside, neomangiferin, myricetin, diosgenin, vinorelbine, ecdyson arbutin), antibiotics(vancomycin, derivatives of vancomycin, daptomycin, telavancin, caspofungin, Pneumocandin B0, teicoplanin, dalbavancin), polypeptides(thymalfasin, octreotide, oxytocin)and others(iohexol , iopamidol , acarbose). 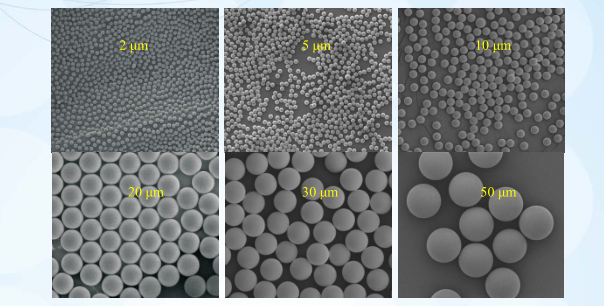 The polymeric matrix, monodispersion and optimal porosity give rise to beneficial features of high resolution and loading capacity, strong rigidity, resistance against acid and base, low back pressure, long lifetime and low non-specific adsorption.Suzhou Nano-Micro Technology Company, Ltd. (Nanomicrotech) offers a new generation of monodisperse spherical polymeric chromatography media, produced using a patented technology that is developed in-house. 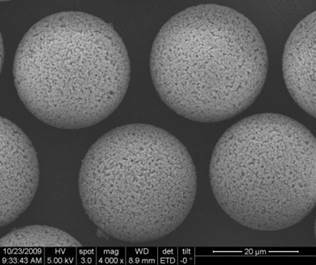 Our monodisperse polymeric media have perfect spherical shape, highly uniform particle size distribution, and precise particle size (Figures 1 and 2). Compared to other commercial chromatography media (with a broad particle size distribution in Figure 2), our media have demonstrated great advantages of strong rigidity, easy column packing, low back pressure, high column efficiency, good resolution, stable column bed and lower risk of frit-plugging. Pore size and specific surface area have a strong influence on the separation performance of chromatography media. 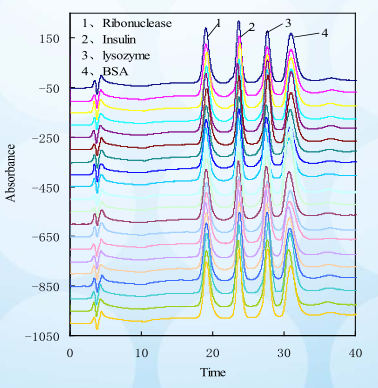 The choice of a chromatography media with correct pore structure would improve the loading capacity, the column efficiency and the final purity of target molecule. We offer media with pore sizes typically from 50 Å up to 1000 Å.
UniPS® chromatography media, made from highly cross-linked polymers of styrene and divinylbenzen, have excellent pH stability over a wide range of pH 1-14. These chromatography media maintain their outstanding physical and chemical stability even in extremely acidic or alkaline solutions (for e.g. 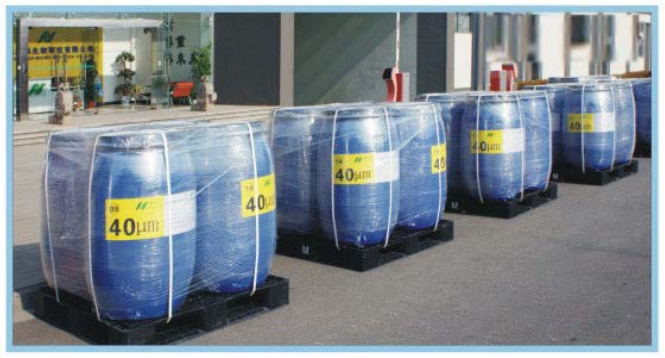 1 M NaOH/HCL) and organic solvents (such as methanol, ethanol, acetone, n-propanol, isopropanol, DMSO, THF, acetonitrile, 6 M guanidine hydrochloride, etc.). UniPS® provides the customers a wider choice of conditions for process development and optimization. The outstanding chemical stability, have been proven to meet the requirements of Cleaning-in-Place (CIP) in cGMP operations. 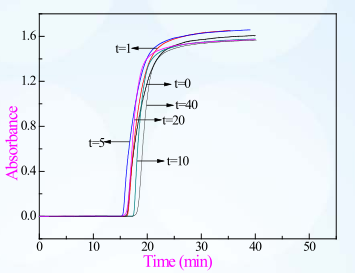 For example, the loading capacity and separation efficiency remain unchanged, after a UniPS® 10-300 column was soaked in 1 M NaOH at 60°C for 40 days (Figure 4, used for Insulin purification). Our state-of-the-art manufacturing facilities enable the bulk production of media, and a good quality control system assures the highest quality and batch-to-batch reproducibility. Figures 6, 7 and 8 showed the results of the performance test of more than twenty different lots of the chromatography media, indicating the good batch-to-batch reproducibility in our production. Nanomicrotech provides customers more choices of different materials and surface polarity, for process optimization, for example UniPS®, UniPSN and UniPMM, with increasing surface polarity in that order. Nanomicrotech has an in-house application development group with vast experiences. This group support customers with a lot of technical services, from process development to technical transfer for production at industrial scale. * Custom-made particle and pore sizes are available upon request. Looking for ideal What Is Chromatography In Chemistry Manufacturer & supplier ? We have a wide selection at great prices to help you get creative. All the Counter Current Chromatography are quality guaranteed. We are China Origin Factory of Affinity Column Chromatography. If you have any question, please feel free to contact us.